Sheri - Georgia Great Product "I bought this a few weeks ago and it keeps bugs from hitting me in the face." Robert - Potosi, MO Great Windshield for the Price! "If you’re looking for a cheap alternative for a windshield, than this is it. I am pretty impressed with the quality of the fabric. 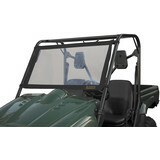 It’s not the same as having an actual lexan windshield but still gets the job done and at a very affordable cost! Fitment was easy and instructions are easy to follow. The beauty of this windshield is that it’s easily removable for transporting or when you simply just want it to take it off."